The Jackpot Factory Group is a premier online casino organisation and one of the most well-known and reputable casino brands on the Web, alongside such big players as Fortune Lounge Group. Boasting several successful member sites, its flagship brand is All Slots Casino, one of our top recommended sites for Internet slots. All Slots Casino: The flagship website of the group, All Slots has rightly proven itself as a premier online establishment for the best Internet pokies, jackpot progressives, and table games. All Jackpots Casino: The main sister site to All Slots, it’s also referred to as the “big baby” of the Jackpot Factory Group, having officially launched in 2003. It is similar in aesthetic and game offerings as All Slots, but with a larger emphasis on huge jackpots slots and table games. First Web Casino: Appropriately named due to being the first of the Jackpot Factory Group of sites to open in 1999, First Web Casino remains a popular online destination for high-quality real money casino games today. Wild Jack Casino: Another strong addition of the Jackpot Factory Group, Wild Jack Casino also has a dedicated mobile section with a range of the best pokies ported to smartphones and tablets and fully playable with a data connection. The VIP Lounge Casino: A premium site of the JFG, the VIP Lounge Casino is primarily marketed towards high-stakes players seeking the V.I.P. treatment. Almost all real money players at the site were given access via invitation only, to maintain its exclusivity approach to online gambling. The Jackpot Factory Group was established in 1999 at the dawn of the millenium and Internet era as one of the first casino organisations to set up on the Web, and recognise the advancement and growing importance of the medium and the demand for alternative gambling experiences available outside of a brick and mortars casino. Among the first operators to host Microgaming pokies games, the JFG websites like All Slots Casino have built excellent reputations over the last 15 years for consistent customer support, safe casino banking, instantaneous payouts, and daily and weekly bonuses. Are Jackpot Factory Group casinos safe? Yes. 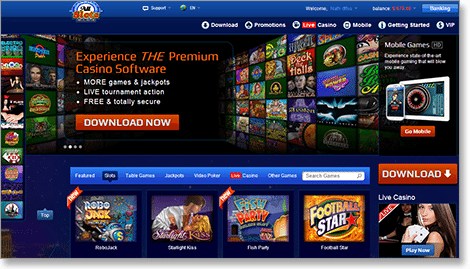 The group’s various casino websites have built their legitimacy and trustworthy reputation from nearly 15 years of offering high-quality pokies and safe casino banking transactions and payouts for tens of thousands of online players. However, their safety and security is not attributed from their age alone. Independent auditors like the Kahnawake Gaming Commission (KGC), well-known regulation bodies like the Malta Gaming Authority (MGA) and watchdog organisations like eCOGRA (eCommerce Online Gaming Regulation and Assurance) regularly check up on the site to ensure fairness, responsibility and safe gaming is offered on their sites – represented by the official seal of approval from eCOGRA and other badges of certification displayed at the bottom of every JFC site’s homepage. All JFG casinos are licensed by the KGC since 1999 and are frequently regulated to this day. Redeem up to $1600 free when you play real money pokies at All Slots Casino.